I started making a tumbler quilt using Kate Spain's Fandango fabric a while ago as a leader and ender project. I started by sewing tumblers in groups of twos randomly, but with purpose. I never pieced the same color or pattern together. The pieces were cut with my Go! cutter out of two charm packs of Kate Spain's Fandango. Well, I finished the quilt at retreat this weekend and I can officially have my design wall back at my house. 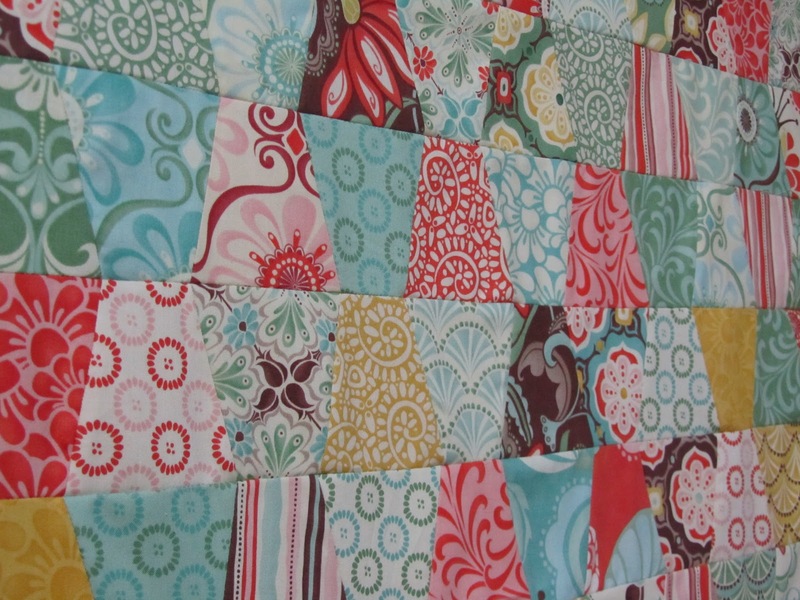 Here's the quilt up on the design wall at retreat. I have been working on this one for quite some time, at least six months, so it's good to see it completed. 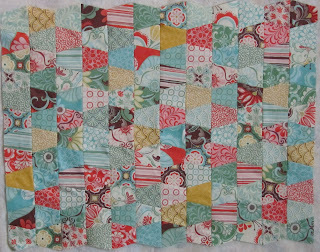 I'll probably finish it with some straight line quilting. It's not very big, so it shouldn't take me that long. Here's a close up of the quilt. This was quilt top number one that I finished at retreat! Yay!